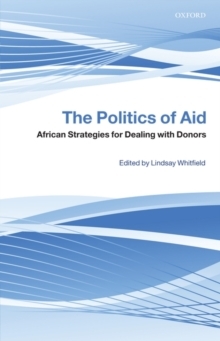 This book presents an original approach to understanding the relationship between official aid agencies and aid-receiving African governments. The first part provides a challenge to the hazy official claims of aid donors that they have stopped trying to force African governments to do what 'we' think is best for 'them' and instead are now promoting African 'ownership' of the policies and projects which foreign aid supports. The authors tease out the multiple meaningsof the term 'ownership', demonstrating why it became popular when it did, but also the limits to this discourse of ownership observed in aid practices. The authors set out to defend a particular vision of ownership-one that involves African governments taking back control of their developmentpolicies and priorities. Based largely on interviews with the people who do the negotiating on both sides of the aid relationship, the country case studies put the rhetoric of the new aid system to a more practical test. The authors ask how donors seek to achieve their policy objectives without being seen to push too hard, what preconditions they place on transferring authority to African governments, and what effect the constant discussions over development policy have on state institutions,democracy and political culture in recipient countries. It investigates the strategies that African states have adopted to advance their objectives in aid negotiations and how successful their efforts have been. Comparing the country experiences, it points out the conditions accounting for the varyingsuccess of eight African countries: Botswana, Ethiopia, Ghana, Mali, Mozambique, Rwanda, Tanzania and Zambia. It concludes by asking whether the conditions African countries face in aid negotiations are changing.